Tune in on Wednesday, October 10 to WKCR 89.9 FM-NY for 24 hours of Thelonious Sphere Monk’s music in celebration of the 101st day of his birth. Born in 1917 in North Carolina but raised in Manhattan, Monk first established his musicianship as a mostly self-taught travelling church organist. He marked his grand entrance into the New York jazz scene in 1941 as the new house pianist at the Minton’s Playhouse, the breeding grounds of bebop. 1944 saw his first studio recording with the Coleman Hawkins Quintet, and in the fall of 1947 Monk released three Blue Note sessions as his first leader recordings. 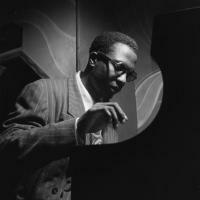 Over the course of the next decade he recorded with Blue Note, Prestige Records, and Riverside records. After joining Columbia Records in 1962, he formed his famous quartet with tenor saxophonist Charlie Rouse, bassist John Ore, and drummer Frankie Dunlop. He later teamed up with Ore to form another quartet with Larry Gales on bass and Ben Riley on drums, and played with them for the majority of the remainder of his musical career. As he surrounded himself early on with such widely influential contemporaries as Dizzy Gillespie, Kenny Clarke, and Charlie Parker, he quickly began to define his modern and idiosyncratic sound. Monk characterized himself by his sparse, angular melodies, as well as with his tendency to experiment with tonality as a soloist and especially as a composer. Many of his tunes, notably “Well You Needn't,” “Epistrophy,” and “In Walked Bud,” pushed the boundaries of chordal harmony—especially for pianists—and entered the jazz lexicon where they remain today. Monk’s abstract harmonic and melodic approach combined with his grounding in stride and other more traditional jazz idioms set him apart from his contemporaries as a heady and quirky yet deeply inventive artist. His unconventional practices had a huge influence on the style of the new wave of rising bop musicians, both on and off the instrument—his so-called “bop glasses” and beret became a symbol of musical experimentation for the generation of musicians that followed in his footsteps. Join us at WKCR as we dedicate 24 hours of honorary programming to one of jazz’s most essential driving forces: Thelonious Monk.